Which models are making the Indian hatchback segment grow at tyre-burning speed? Just four models accounted for nearly half of the growth last year. Among the other 18 models were some surprising losers. Maruti Alto, Ford Figo, Chevrolet Beat and Hyundai i20 – take a bow. Together, you have made the hatchback the fastest growing segment in the fastest growing car market in the world. 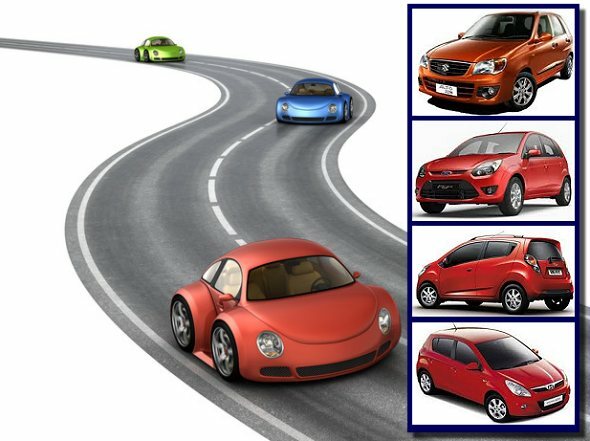 Indians bought up 15.5 lakh hatchbacks in 2010-2011, up from just over 10 lakhs in the previous year. That’s a growth of 65 per cent in one year. Alto was the highest performer, accounting for almost a fifth of the growth, or about 100,000 additional cars. Clearly, the introduction of its new model, the Alto K10, helped. Ford Figo came close behind, increasing sales by nearly 70,000 cars, up from about 8,000 last year. The Hyundaii20 pushed up sales by another 40,000 cars. The Chevrolet Beat has also been gaining favor among buyers with General Motors pushing an aggressive maintenance package. In other words, these four cars accounted for nearly half the growth in hatchback segment last year. The Tata Nano too showed good growth, but we wouldn’t qualify that as a winner, given that it’s fallen far short of its more than 100,000 units a year sales target. The rest of the growth was shared between 18 other models – not including variants – ranging from veterans like WagonR, Hyundai i10 and Maruti Swift to newbies like Nissan Micra and Volkswagen Polo. Volkswagen Polo, in fact, made a strong entry, selling 28,904 cars last year. One brand that is losing market share despite launching a new variant last year is Tata’s Indica. The introduction of Indica Vista doesn’t seem to have helped, with sales slumping by about 16 per cent to just under 96,000 units. In fact, new entrant Ford Figo is closing in on the Tata Indica in sales numbers. Sales of the Maruti 800 too have been steadily declining as the car is being phased out. Sales were down nearly 20 per cent last year as the car is no longer sold in metros. Tata’s other contender, the Tata Nano, registered good growth last year after its early troubles, growing by over 130 per cent to about 70,000 units. A focused ad campaign and offers of extended warranties seem to have helped. However, considering this is India’s cheapest car, one would have expected the Nano to chalk up better numbers, but clearly, buyers see more value in tried-and-tested brands like the Maruti Alto at the entry level. Chevrolet’s Spark has seen a drop in sales. It has become a victim of cannibalization as buyers prefer the newer and fresher Beat, that’s priced just slightly above the Spark. Nissan’s Micra also seems to have got off to a sluggish start selling only about 12,200 cars last year, quite unlike competitor Volkswagen’s Polo which sold 28.904 cars last year, despite making a late entry. Nissan’s decision to premium-price the Micra seems to have limited its appeal. Skoda Fabia grew by almost 70 per cent last year after the company revamped the model and reduced prices in the second half of the year. Sales, however, crept up only to about 11,000 units. Skoda needs to focus on its service network and cost of spares to increase numbers. Other losers were the Honda Jazz, which has seen few takers because of its premium pricing, Hyundai Getz and Chevrolet Aveo U-Va (see table). Maruti clearly dominates the entry-level hatchbacks segment with price tags below Rs. 4.5 lakh. The Hyundai i10 has been steadily gaining sales, but continues to fall just short of the Wagon-R’s annual sales, which stand at about 1.63 lakh units. The action in this segment is heating up though, with the Ford Figo and the Chevrolet Beat wooing buyers away with cars loaded with equipment. Among premium hatchbacks or cars priced above Rs. 4.5 lakh, the Maruti Swift dominates with more than 140,800 units being sold last year. The Hyundai i20 though has seen good sales last year and is in the number two spot among premium hatchbacks, with a growth of 104 percent. Volkswagen Polo has taken the third spot among premium hatchbacks, ahead of its cousin the Skoda Fabia. This year, the premium hatchback market is likely to see much more choice and further fragmentation with the introduction of the Toyota Etios Liva and the Honda Brio later this year.